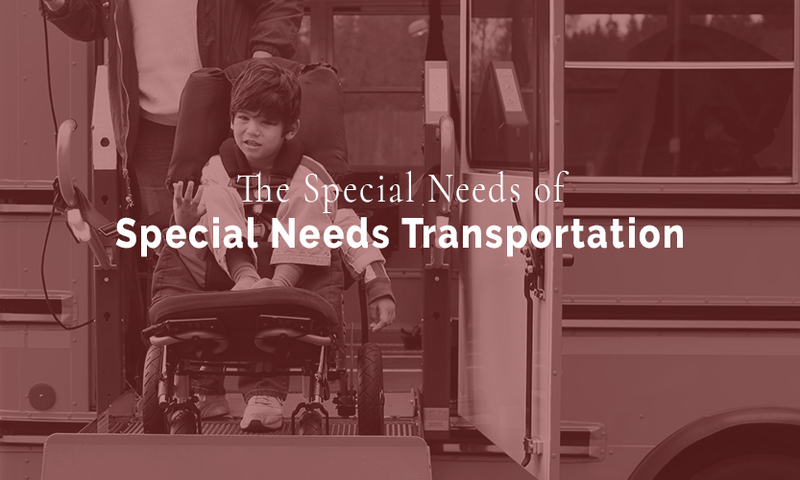 Among the complexities of running a school bus transportation system, administrators and transportation directors must consider the additional requirements of special needs students in their district. By law, school systems are responsible for making sure that all children of all needs are safely transported to and from their appropriate school, by the district. Current guidelines outline the requirements for district plans, including the types of vehicles needed, the personnel that should be available, and the training suggested for school staff. School buses that are catered to special needs students often come with additional equipment for those with specific health care needs, including the use of car seats or wheelchairs. For example, students who need wheelchairs should be secured in a forward-facing position with fastening devices that are attached to the floor, according to the American Academy of Pediatrics. These buses should be equipped with chair lifts as well to securely move passengers on and off the bus. Depending on the district, nurses or aides with medical training may be required to assist students while on school transportation, particularly those with tracheostomies or respiratory difficulties. Training programs should be updated annually with the latest recommendations, which may require input from therapists, nurses, and certified child passenger safety technicians. School systems must also prepare an emergency evacuation plan and comprehensive infection control program. Driving special needs students can be difficult when school bus drivers are trying to concentrate on the road and transport students safely. Those with additional training must be familiar with and understand the Individual Education Plans (IEPs) of their passengers. It is also especially important for these drivers to exhibit extra patience, understanding, and a comforting approach to picking up and dropping off students each day. At Fairport Central School District in New York, for instance, school bus driver Scott Reynolds welcomed a special needs student onto his vehicle for years, often giving him a fist bump, asking how he was doing, and genuinely caring about the student boarding the bus. When Reynolds retired from the school district after 35 years, the student’s family wrote a kind letter to thank him for genuinely caring about their son for such a long time. Like Reynolds, special bus drivers can make a big difference in the lives of special needs students going to school each day.